Our hosted Raspberry Pi 3 servers make a great platform for learning how to run a server. 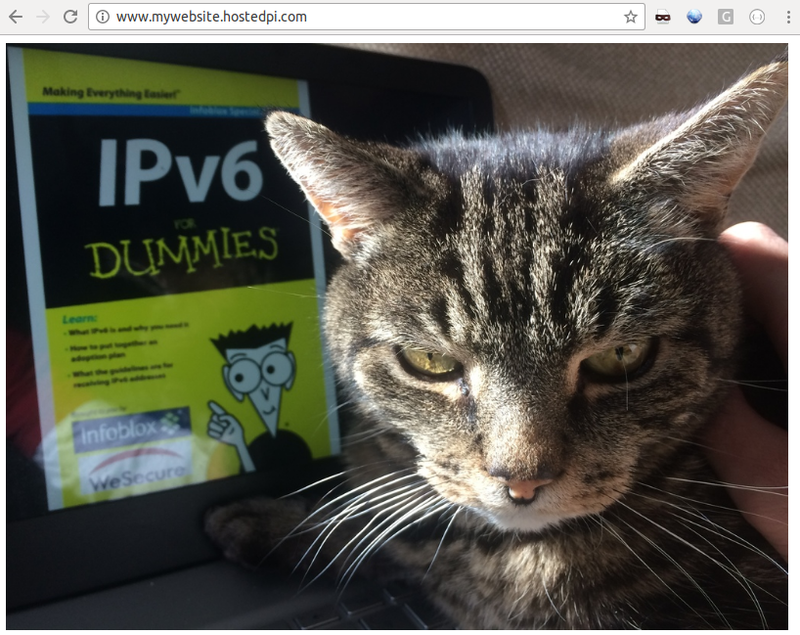 They’re particularly interesting as they only have IPv6 connectivity, yet they can still be used very easily to host a website that’s visible to the whole Internet. This guide walks through the process of setting up a website on one of our hosted Pis, including hosting your own domain name, setting up an SSL certificate from Let’s Encrypt, automating certificate renewal, and using our IPv4 to IPv6 HTTP reverse proxy. We use SSH keys rather than passwords. Click on the link, and you’ll be asked to paste in an SSH public key. 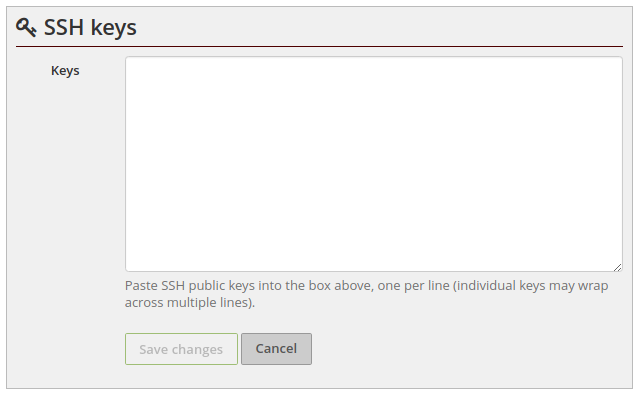 If you don’t have an SSH public key, you’ll need to generate one. On Unix you can use ssh-keygen and on Windows you can use PuTTYgen. Details of exactly how to do this are beyond this guide, but Google will throw up plenty of other guides. The authenticity of host '[ssh.mywebsite.hostedpi.com]:5125 ([93.93.134.53]:5125)' can't be established. ECDSA key fingerprint is SHA256:Hf/WDZdAn9n1gpdWQBtjRyd8zykceU1EfqaQmvUGiVY. Warning: Permanently added '[ssh.mywebsite.hostedpi.com]:5125,[93.93.134.53]:5125' (ECDSA) to the list of known hosts. Another computer on the web serving cat pictures! Magically, this site on your IPv6-only Raspberry Pi 3 is accessible even to IPv4-only users. To understand how that magic works, we’ll now host a different domain name on the Pi. We going to use the name mywebsite.uid0.com. If you’re using a hostname that already has other records, such as a bare domain name that already has MX and NS records, you can use an ANAME pseudo-record. Our proxy server listens for HTTP and HTTPS requests on both IPv4 and IPv6 addresses, and then uses information in the request header to determine which server to direct it to. This allows us to share one IPv4 address between many IPv6-only servers (actually, it’s two IPv4 addresses as we’ve got a pair of proxy servers in different data centres). We need to tell the proxy server where to send requests for our hostname. 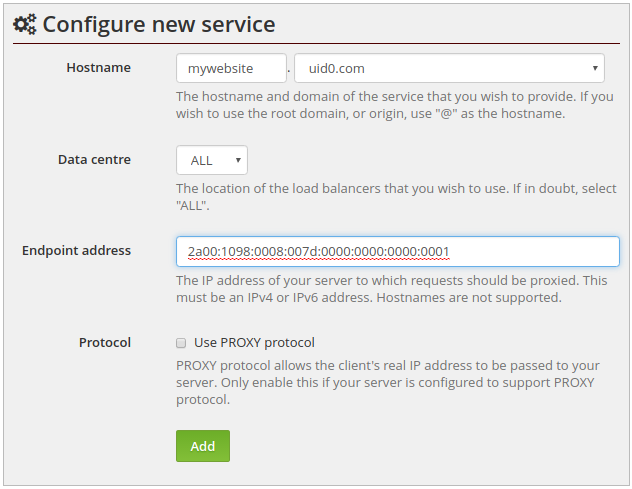 To do this, visit the IPv4 to IPv6 Proxy page the control panel. The endpoint address is the IP address of your server, which you can find on the details page for your server, as shown above. For the moment, leave PROXY protocol disabled – we’ll explain that shortly. After adding the proxy configuration, wait a few minutes, and after no more than five, you should be able to access the website using the hostname set above. We’re firmly of the view that secure connections should be the norm for websites, and now that Let’s Encrypt provide free SSL certificates, there’s really no excuse not to. We’re going to use the dehydrated client, as it’s packaged for the Debian operating system that Raspbian is based on. Unfortunately, it’s not yet in the standard Raspian distribution, so in order to get it, you’ll need to use the “backports” repository. Now add a section for an SSL enabled server running on port 443. You’ll need to amend the certificate paths to match your hostname. You can copy and paste the block below straight into your terminal, or you can edit the 000-default.conf file using your preferred text editor. dehydrated will check the age of the certificate daily, and if it’s within 30 days of expiry, will request a new one, logging to /var/log/dehydrated-cron.log. If you look at your web server log files, you’ll see one disadvantage of using our proxy to expose your site to the IPv4 world: all requests appear to come from our proxy servers, rather than the actual clients. This is obviously a bit annoying for log file analysis, but is a big problem for any kind of IP-based access controls or rate limiting. Fortunately, there’s a solution, which we’ll look at in the next post.